As you know, the Metropolitan Manila Development Authority has put in effect its no-contact apprehension policy, which means you can now be cited for a traffic violation through the agency's network of CCTV cameras scattered throughout the metro, without a human traffic officer having to physically accost you and issue you a violation ticket. 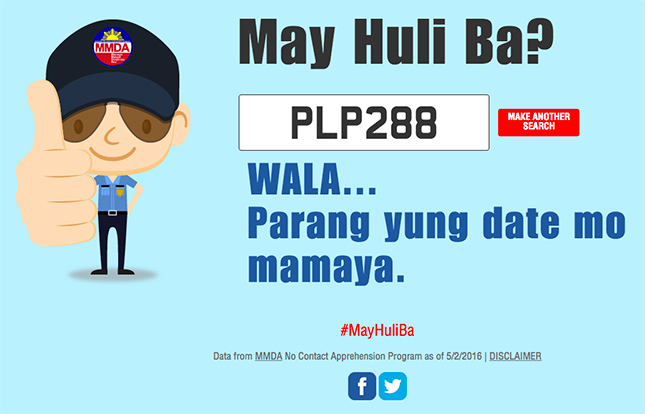 And if you do get caught by the MMDA's no-contact team, you will be sent a formal notification that you have been charged with an infraction and that you need to settle the penalty that goes with it. Understandably, the concern of many is this: How do I know if I've been charged with a violation? What if I don't get the notice for a variety of reasons (like a change of address, for instance)? Well, that issue is now being officially addressed by the agency by launching a website called May Huli Ba? 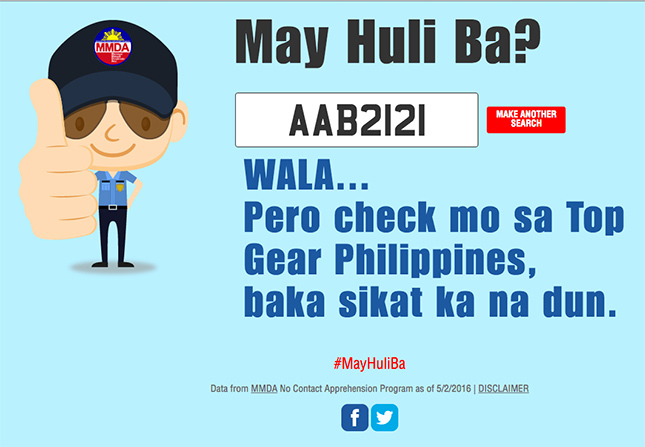 The other day, we reported that the MMDA is introducing a project called Na-HuliCam Ka Ba? 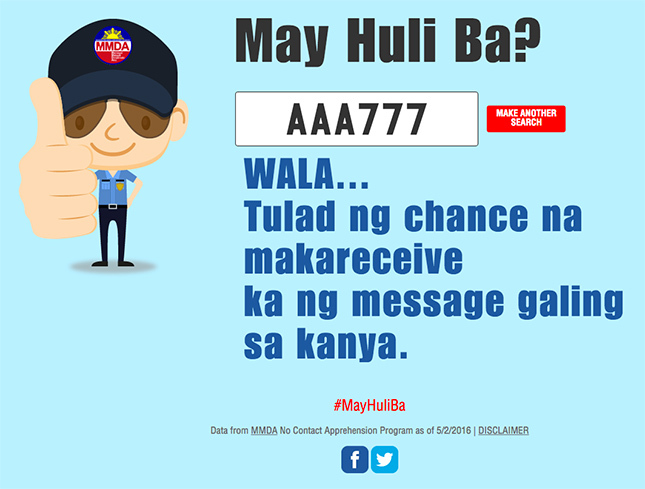 This is primarily to serve the purpose of conveniently informing motorists about possible traffic violations. And the website is formally going live today. 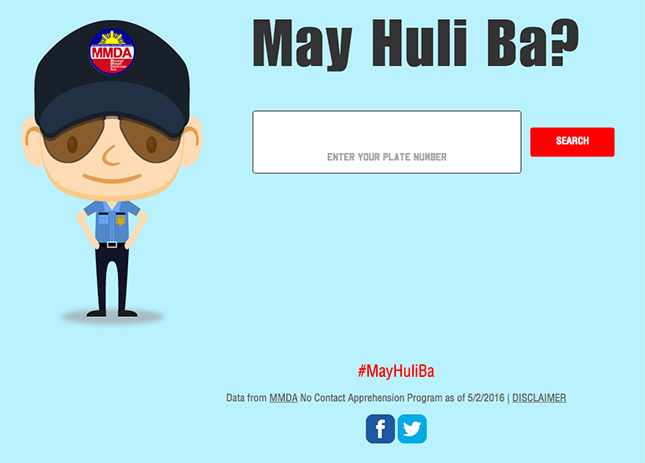 All you have to do is go to the website and type in your plate number. If you do have an infraction, this is what you're going to see: your violation, the exact location where you committed it, and the date and time when you committed it. 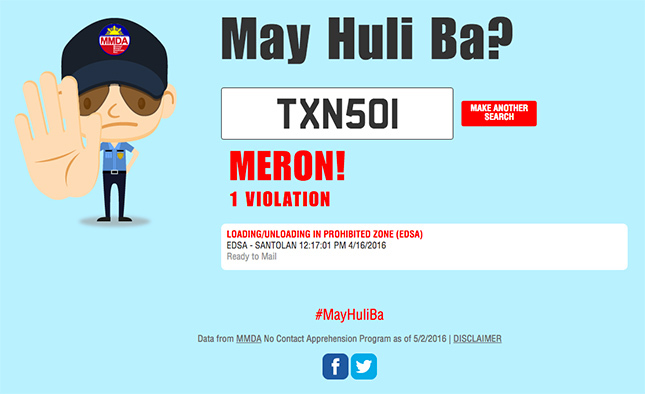 In a statement, MMDA chairman Emerson Carlos said: "The agency has taken the initiative to develop the system in response to netizens’ demand to provide motorists with an easy and efficient way to verify if they have been cited for a traffic infraction under the no-contact apprehension scheme. 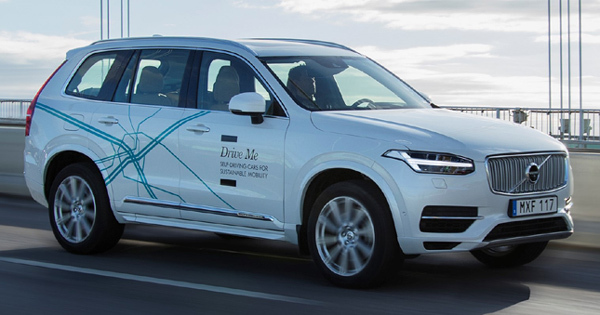 The system will facilitate the verification process by motorists on traffic violations and also assuage their fears that they could have been wrongly cited for road infractions." Slow clap for the MMDA, guys?